This is a smoking gun that modern humans interbred with Neandertals, following up on the publication of the Ust'Ishim and Kostenki-14 genomes; these two had longer Neandertal chunks than modern humans, from which it was estimated that their Neandertal admixture happened more than 50,000 years ago, roughly what one gets when looking at Neandertal chunks in modern humans alone. The Oase1 has even longer Neandertal chunks, and Neandertal admixture happened in its very recent past. So, it seems that Neandertal admixture was not a one-off event but is bracketed at least by the period 50-40 thousand years ago and happened in at least two places: Europe and the Near East. The fact that the earliest European sample (N=1) has a recent Neandertal ancestor indicates that Neandertal admixture in the earliest Europeans cannot have been extremely rare or non-existent; if it were, the chances of finding one with the first try would be extremely low. It is unlikely that Neandertals were killed off by modern humans immediately after the arrival of the latter in Europe, as the Oase1 is dated well after the arrival of modern humans to Europe. Modern Europeans don't seem to be particularly related to the population of Oase1. After one substracts contamination and Neandertal admixture, what is left over is actually closer to East Asians than modern Europeans. But, it's equally close to East Asians and European hunter-gatherers. This can be explained if modern Europeans have ancestry from the mysterious "Basal Eurasians" via the Neolithic farmers. Why did the Neandertals (and the significantly-Neandertal admixed AMH like Oase1) disappear? My bet is on the Campanian Ignibrite eruption. Neanderthals are thought to have disappeared in Europe approximately 39,000–41,000 years ago but they have contributed 1–3% of the DNA of present-day people in Eurasia1. Here we analyse DNA from a 37,000–42,000-year-old2 modern human from Peştera cu Oase, Romania. Although the specimen contains small amounts of human DNA, we use an enrichment strategy to isolate sites that are informative about its relationship to Neanderthals and present-day humans. We find that on the order of 6–9% of the genome of the Oase individual is derived from Neanderthals, more than any other modern human sequenced to date. Three chromosomal segments of Neanderthal ancestry are over 50 centimorgans in size, indicating that this individual had a Neanderthal ancestor as recently as four to six generations back. 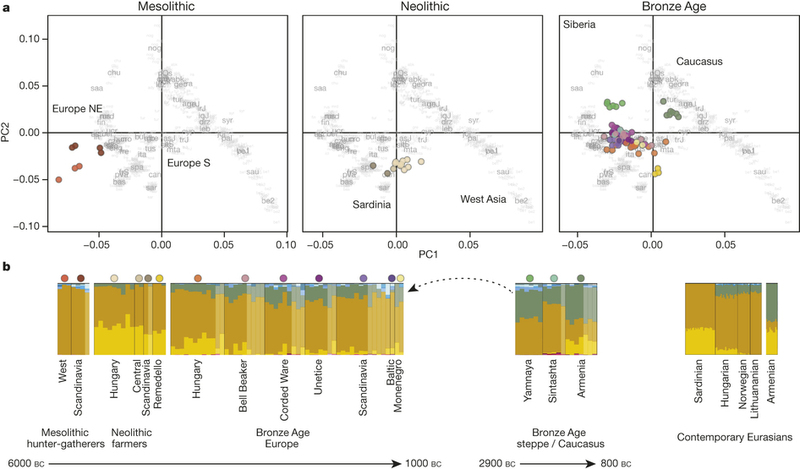 However, the Oase individual does not share more alleles with later Europeans than with East Asians, suggesting that the Oase population did not contribute substantially to later humans in Europe. Ten petrous bones were selected from archaeological specimens, representing a wide range of geographical locations and climatic contexts (Table 1, for repository information see S1 File). The specimens were selected from Central Europe, Central Asia, Southeast Asia, the Levant, Anatolia, and North Africa. The specimens are from Holocene archaeological contexts dated to between 10,000–1,800 calibrated years before present (cal. BP). The samples from Nubia, Jordan and Turkmenistan are from hot and arid regions. The sample from Turkey is from the Eastern Mediterranean (northwestern Turkey); the samples from Hungary and Serbia are from the Carpathian Basin/Southeast Europe, while the two samples from Cambodia and Vietnam are from tropical/subtropical Southeast Asia. We also included a metatarsal bone for one Neolithic individual from Hungary (Polgár Ferenci hát, PF280-443) as a control to confirm the differences between petrous and non-petrous reported in the previous study . It has recently been demonstrated  that petrous bone samples yield exceptionally high percentages of endogenous ancient DNA. Here we have shown that both the total amount of endogenous DNA that can be recovered as well as the percentage of all reads that represents endogenous DNA vary substantially for different parts of the petrous bone. Our results have several implications for aDNA studies. The results support the hypothesis that dense bone parts are especially suitable for ancient DNA research, with the densest part of the petrous bone, that which composes the otic capsule, providing the best results. For our samples the yields obtained for this part (part C) exceed those obtained for part B (i.e. dense bone part of the petrous outside the otic capsule) by up to 65-fold and those from part A by up to 177-fold. It is therefore apparent that while high endogenous yields can be obtained from part B, and hence from any dense part in the petrous, optimal yields should be obtained from bone sample taken directly from the otic capsule. Finally, our results show that endogenous yields from the five samples which originated from hot (either arid or humid) regions were always lower than 1% including extractions from part C of the petrous bone. However, deamination patterns suggest for two (Ain Ghazal and Vat Komnou) of the three samples for which we obtained sufficient numbers of reads that the obtained sequences are likely endogenous to the bones (S3 Fig). In contrast, the deamination pattern for the third sample, Man Bac, suggests that the human reads obtained are more likely to represent contamination than endogenous ancient DNA. These results suggest that it may be possible to obtain endogenous DNA from part C also for samples with relatively low amounts of endogenous DNA from hot environments, although extreme caution will be necessary in the interpretation of the results obtained from such samples. 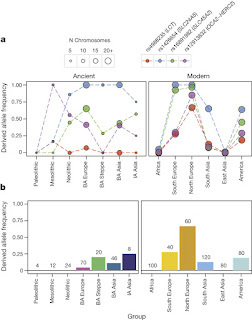 The invention and development of next or second generation sequencing methods has resulted in a dramatic transformation of ancient DNA research and allowed shotgun sequencing of entire genomes from fossil specimens. However, although there are exceptions, most fossil specimens contain only low (~ 1% or less) percentages of endogenous DNA. The only skeletal element for which a systematically higher endogenous DNA content compared to other skeletal elements has been shown is the petrous part of the temporal bone. In this study we investigate whether (a) different parts of the petrous bone of archaeological human specimens give different percentages of endogenous DNA yields, (b) there are significant differences in average DNA read lengths, damage patterns and total DNA concentration, and (c) it is possible to obtain endogenous ancient DNA from petrous bones from hot environments. We carried out intra-petrous comparisons for ten petrous bones from specimens from Holocene archaeological contexts across Eurasia dated between 10,000-1,800 calibrated years before present (cal. BP). We obtained shotgun DNA sequences from three distinct areas within the petrous: a spongy part of trabecular bone (part A), the dense part of cortical bone encircling the osseous inner ear, or otic capsule (part B), and the dense part within the otic capsule (part C). Our results confirm that dense bone parts of the petrous bone can provide high endogenous aDNA yields and indicate that endogenous DNA fractions for part C can exceed those obtained for part B by up to 65-fold and those from part A by up to 177-fold, while total endogenous DNA concentrations are up to 126-fold and 109-fold higher for these comparisons. Our results also show that while endogenous yields from part C were lower than 1% for samples from hot (both arid and humid) parts, the DNA damage patterns indicate that at least some of the reads originate from ancient DNA molecules, potentially enabling ancient DNA analyses of samples from hot regions that are otherwise not amenable to ancient DNA analyses. Kennewick Man, referred to as the Ancient One by Native Americans, is a male human skeleton discovered in Washington state (USA) in 1996 and initially radiocarbon-dated to 8,340–9,200 calibrated years before present (BP)1. His population affinities have been the subject of scientific debate and legal controversy. Based on an initial study of cranial morphology it was asserted that Kennewick Man was neither Native American nor closely related to the claimant Plateau tribes of the Pacific Northwest, who claimed ancestral relationship and requested repatriation under the Native American Graves Protection and Repatriation Act (NAGPRA). The morphological analysis was important to judicial decisions that Kennewick Man was not Native American and that therefore NAGPRA did not apply. Instead of repatriation, additional studies of the remains were permitted2. Subsequent craniometric analysis affirmed Kennewick Man to be more closely related to circumpacific groups such as the Ainu and Polynesians than he is to modern Native Americans2. In order to resolve Kennewick Man’s ancestry and affiliations, we have sequenced his genome to ~1× coverage and compared it to worldwide genomic data including the Ainu and Polynesians. We find that Kennewick Man is closer to modern Native Americans than to any other population worldwide. Among the Native American groups for whom genome-wide data are available for comparison, several seem to be descended from a population closely related to that of Kennewick Man, including the Confederated Tribes of the Colville Reservation (Colville), one of the five tribes claiming Kennewick Man. We revisit the cranial analyses and find that, as opposed to genomic-wide comparisons, it is not possible on that basis to affiliate Kennewick Man to specific contemporary groups. We therefore conclude based on genetic comparisons that Kennewick Man shows continuity with Native North Americans over at least the last eight millennia. A new paper in Nature adds to the earlier study in the same journal by presenting data from 101 ancient Eurasians. The year is not yet halfway over, but it seems that the ancient DNA field is moving towards a new norm of studying dozens of individuals at a time and comprehensively tackling the "big problems" that have vexed archaeologists, linguists, and historians for decades if not centuries. 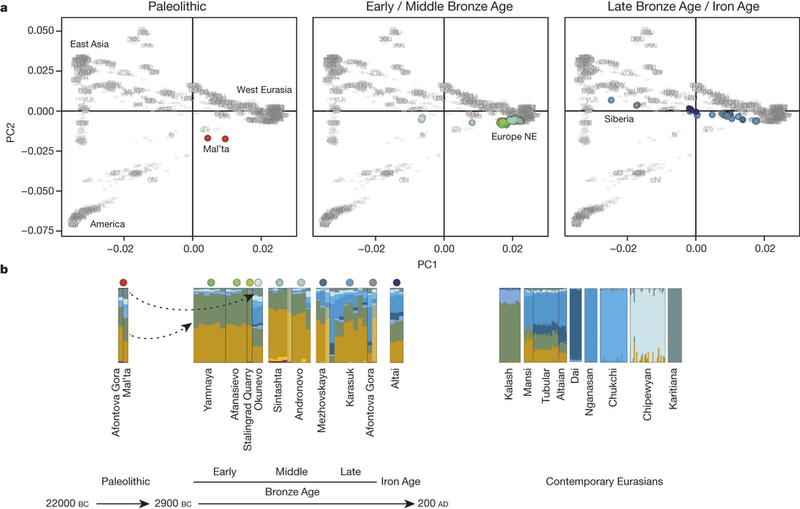 The first conclusion of the new study is the detection of the migration from the steppe to Europe that was the title piece of the earlier study. The authors do not present quantitative estimates of the amount of demographic replacement effected by the Yamnaya-to-Corded Ware migration, so it will be interesting to see if there are any minor significant differences in these. But, the two papers have different Yamnaya and Corded Ware samples, and yet arrive at qualitatively similar conclusions, so at least this part of the story should be considered firmly "settled". The second conclusion is the migration from the European steppe to the Afanasievo culture of the Altai. This has been long-hypothesized based on the physical type of the Afanasievo people and their possession of a similar pastoralist/wheeled vehicle toolkit that would have allowed them to cover the huge difference between Europe and the Altai. This confirms movement #2 of the Anthony/Ringe model, although I doubt that this migration had anything to do with Tocharians as detailed below. But, it did happen. The third conclusion is that the later steppe cultures of the Sintashta and Andronovo (putative Indo-Iranians according to some), were not a continuation of the Yamnaya-Afanasievo people, but had extra Neolithic farmer ancestry. So, it seems that Neolithic farmers entered the steppe, and the development of steppe cultures did not happen in isolation. Whether this involved migration of Corded Ware people (as the authors prefer), who were already a mixture of Yamnaya and Neolithic farmers, or some other mixture of Neolithic farmers with steppe populations (e.g., Tripolye plus Yamnaya) remains to be seen. The fourth conclusion of the paper is that these steppe cultures were also later replaced by people of at least partial East Asian or "Native American"-like ancestry. So, it seems that movements into the steppe happened both on the western end (as the incursion of Neolithic farmer ancestry into the Sintashta proves), but also on the eastern end, with the Europeoid populations of western origin receiving admixture from the eastern periphery of the Eurasian steppe. As for the Yamnaya, the authors do not find a very strong signal of admixture (as did the earlier study), which they attribute quite plausibly to the lack of eastern hunter-gatherers in their dataset. On the other hand, they claim that the "Caucasus" genetic component in the steppe populations was of steppe ancestry rather than Near Eastern/Caucasian origin as was claimed in the earlier paper. This is based on the statistic D(Yoruba, Armenia BA; Yamnaya, Corded Ware) that is not significantly different from zero. However, Corded Ware is a mixture of Yamnaya and European Neolithic, so the sign of this statistic is determined by the sign of the statistic D(Yoruba, Armenia BA; Yamnaya, European Neolithic). If Yamnaya was simply a steppe population, descendants of local people without ancestry from the Middle East/Caucasus, then this statistic would be positive because of the shared Middle Eastern ancestry of Armenia BA and European Neolithic. Whereas, if Yamnaya is a mixture of a steppe population and a Middle Eastern/Caucasian one, then the statistic would be positive/negative for the respective parts, which would be consistent with an average not different from zero. I am sure that when the new data is re-analyzed together with the eastern hunter-gatherers it will be clear that the Yamnaya are not a pure steppe population. 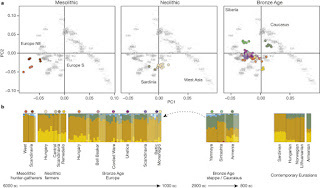 Populations in northern and central Europe were composed of a mixture of the earlier hunter-gatherer and Neolithic farmer10 groups, but received ‘Caucasian’ genetic input at the onset of the Bronze Age (Fig. 2). It seems that my prediction the the West_Asian component would appear in post-5ka Europeans and was related to Indo-Europeans has been adequately confirmed by the last two papers. Speaking of the Caucasus/Middle East, it seems clear as a first approximation that the Bronze Age Armenians are quite similar to modern Armenians. Whether the genetic continuity of Armenians extends beyond the Bronze Age, or Armenians were formed by mixture in the Bronze Age remains to be seen. The question of Armenian linguistic origins is of course separate as it is commonly understood that the Armenian language is unrelated to Anatolian languages and may have arrived in Armenia from the Balkans at around the Bronze Age-Iron Age transition. The authors also study some phenotypic traits such as lactase peristence (Yamnaya had some, but overall prevalence was much lower than modern Europeans, hence lots of selection to the present), and skin eye pigmentation. Like Wilde et al., and Mathieson et al., the steppe populations seem to have had brown eyes. Given that so did Neolithic Europeans, and (presumably) ancient Middle Easterners/Caucasians, I think it's a good bet that Proto-Indo-Europeans (whatever solution to the PIE urheimat one accepts) were a brown-eyed people, or in the very least far from the blue-eyed "Aryans" of racial mythology. Even the Bronze Age and Iron Age Asians seem to have been a predominantly brown-eyed people, although the derived HERC2 allele seems to be at a higher frequency in them than in the steppe Europeans. The story of the Y-chromosomes seems very interesting, although these are not resolved to fine detail. The most interesting aspect of this part of the work is the appearance of haplogroup J in Iron Age samples from Russia, Armenia, and the Altai. This may tie in to the question of the Tocharian origins, which I have claimed were associated with R1b, rather than R1a (as the Indo-Iranians were). The modern Uygurs (who are partially of Tocharian origin) have both J2 and R1b, so were the recipients of West Eurasian elements other than the R1a that so seem to have dominated the eastern steppe, including the Afanasievo. I continue to think there's no evidence that the Afanasievo is Proto-Tocharian, as it's in the wrong place and 3,000 years before the attestation of Tocharian. Overall this is an amazing study which adds a lot to what we know about Bronze Age Eurasia. Hopefully there is more to come in the second half of 2015, but for the time being there is plenty to chew on. New data has been posted online. This seems related to this earlier post. Hopefully the study linked to this data will appear soon, but genome bloggers can get to it thanks to the early data release. 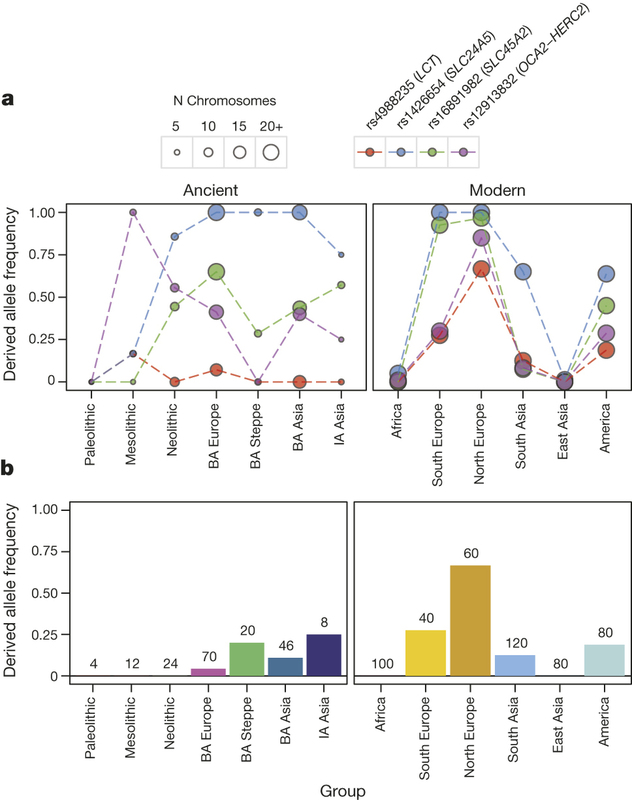 Investigation of Bronze Age in Eurasia by sequencing from 101 ancient human remains.